I bought the Yamaha RX-V379BL 5.1-Channel A/V Receiver receiver primarily to get multiple HDMI inputs. DVD player, Apple TV, Chromecast - they all want an HDMI connection. 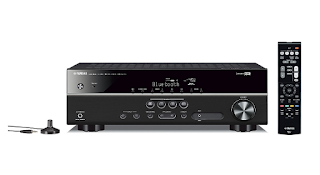 For years I used two Harman Kardon receivers for my two home audio/video rigs. They had only one HDMI input so each had an external splitter and a tangle of cables to go with it. The HK remotes were also very confusing. I initially ordered a cheaper Yamaha receiver with fewer features by mistake but Amazon's return policy let me send it back for a full (and fast) refund. The RX-V379BL has all the connections I wanted - four HDMI inputs and one HDMI output. And it was was very easy to set up, though it did take about an hour and a half to wire five speakers and a subwoofer. I haven't yet used the acoustic optimizer, a microphone that lets you customize settings to suit your listening position and room acoustics. But I did use the Bluetooth feature to pair the receiver with my iPhone. Now I can listed to podcasts in surround sound. And now I have a remote that even my wife has mastered.